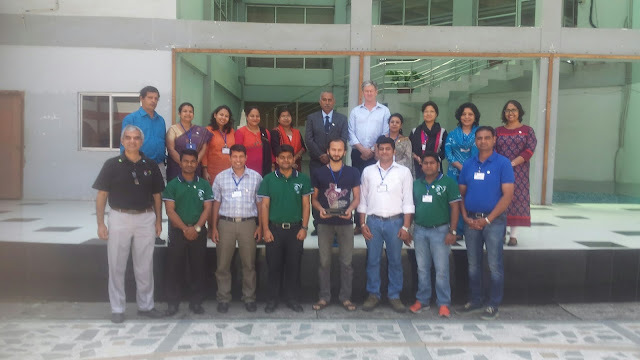 The Asia Pacific Regional Training for Trainers workshop was organized by the National Award Authority India (NAA) from 2nd to 4th April 2016 at Miles Bronson Residential School, Guwahati, Assam. The workshop was lead by Rob Oliphant (Asia Pacific Regional Programme Manager) along with Bivujit Mukhoty (Programme Manager IAYP India). The workshop was attended by fifteen delegates including three delegates from Nepal. The objective of the workshop was to train Award Leaders to become Award Trainers and the primary focus was on learning the use of training aids (visual, auditory, kinesthetic etc.) and presentations. The other sessions included: Training framework, Overview of NAOME assessment (needs, aim, objectives, methods, evaluation), Training needs analysis (TNA), Training design, Multiple intelligences, Development of training materials and training aids, Award mapping, Group work, Delivery styles & skills, Generation theory, Overview of International Award Foundation (IAF), Online Record Book (ORB), Quality assurance of Award units, Action planning & evaluation and Online Learning Hub (OLH). In order to be proficient in any of the above mentioned aspects of training, the participants were instructed on their role and responsibilities as future Award Trainers and were taught the essentials of giving clear instructions for an activity during a presentation through NAOME, TRaM (task, reason, method), and CaRS (context, report back, summary). The delegates were introduced to different learning styles and the factors that keep the current generation motivated were also discussed. The delegates learnt the art of presentation of live scenarios to different stakeholders of the Award Programme. The training team also shared the key notes and documents which will be useful for development of training aids. The workshop concluded on 4th April with the presentation of Training badges to the delegates by Founder & Principal Dr Nripen Dutta of Miles Bronson Residential School, Guwahati, Assam. A big thanks to Miles Bronson Residential School, Guwahati, Assam for their hospitality and support for conducting this workshop.